Pensacola, Florida is chock full of things to do for every member of your household. Whether you’re an outdoor enthusiast looking for natural beauty, an animal lover looking for a close encounter, a fashionista in search of top-notch shopping, a golfer looking for a place to tee off, or a foodie interested in grabbing some grub, you’re always within a hop, skip, and a jump away from something fun to do. There are several guided tours that include ghost tours, tours of civil war history in the area, red light district tours, historic home tours, and more. Visit the galleries, museums, and historic landmarks. Take a selfie, check in, and share your adventures in Pensacola with the ones you love. Here’s a few things to get you started. National Naval Aviation Museum is the largest Naval Aviation museum in the world, displaying restored historic, one-of-a-kind aircraft representing several branches of the United States military. The exhibits span 350,000 square feet, and the grounds encompass 37 acres. The National Naval Aviation Museum is located at 1750 Radford Blvd, NAS Pensacola, Pensacola, Florida 32508-5400. For more information, call 800-327-5002. Pensacola Lighthouse and Museum has been a staple in the Pensacola community since its establishment in 1859. Learn how the tower captured stories in American History from Civil War era, U.S. Coast Guard, maritime history, and local archaeology along your climbing tour of the tower, then stop by the museum and gift shop for a souvenir from your visit. 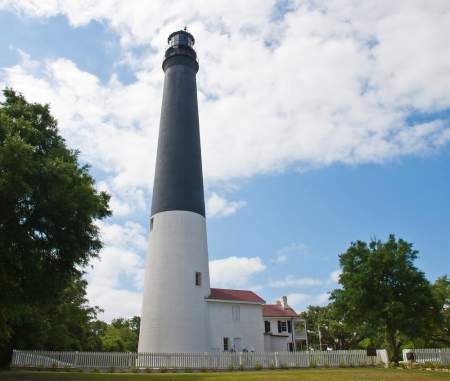 Pensacola Lighthouse and Museum is located at 2081 Radford Blvd, Pensacola, FL 32508-5403. For more information, call 850-393-1561. Uncle Sandy’s Macaw Bird Park is dedicated to the health, care, and well-being of unwanted parrots and other exotic birds in the area. Sandy had a life-long love of the birds and built an aviary where his birds could fly free. Soon, wounded, lost, and abandoned birds began finding his sanctuary, and neighbors began asking to visit, which spawned the evolution of the park. Sadly, Sandy lost his battle with cancer, but the community came together to establish his park as a non-profit organization to continue his work in rescuing and caring for exotic birds. Uncle Sandy’s Macaw Bird Park is located at 9513 N Palafox St, Pensacola, Florida 32534-1220. For more information, call 850-270-2130. Pensacola Art Museum is your opportunity to celebrate your inner muse and appreciate the creative works of local and international artists. What once was a jail built to protect the town is now an art museum dedicated to the preservation and showcasing of fine art and educational opportunities. Pensacola Art Museum is located at 407 S Jefferson St, Pensacola, FL 32502-5901. For more information, call 850-432-6247. Sam’s Fun City is a way to enjoy Florida’s fun in the sun without having to deal with the sand. This water-based theme park is a great way for everyone in your household to make a splash, have some fun, and create memories that will last a lifetime. Sam’s Fun City is located at 6709 Pensacola Blvd, Pensacola, Florida 32505-1700. For more information, call 850-505-0800. Voices of Pensacola is a beautiful way to celebrate the diversity of the community, and honoring the various cultures contributing to the development of the area. Watch and listen to videos, explore area maps and documents, and stop by the gift shop to pick up a little something to remember your visit. Voice of Pensacola is located at 117 E Government St, Pensacola, Florida 32502-5801. For more information, call 850-595-5840. Pensacola is peppered with museums, art galleries, boutiques and specialty shops, small diners and elegant restaurants for fine dining. Here, you can enjoy outdoor water activities like sunning, swimming, fishing, boating, kayaking, canoeing, parasailing, and more, as well as non-water related adrenaline rushing fun like hiking, biking, skating, and exploring the area on foot. There are movie theaters, bowling alleys, miniature golf centers, arcades, children’s museums, parks, and more. No matter your age, size, gender, style, skill level, interests, or financial background, there is something for you to do in Pensacola, Florida. Entertaining things to do and explore in Pensacola, Florida.